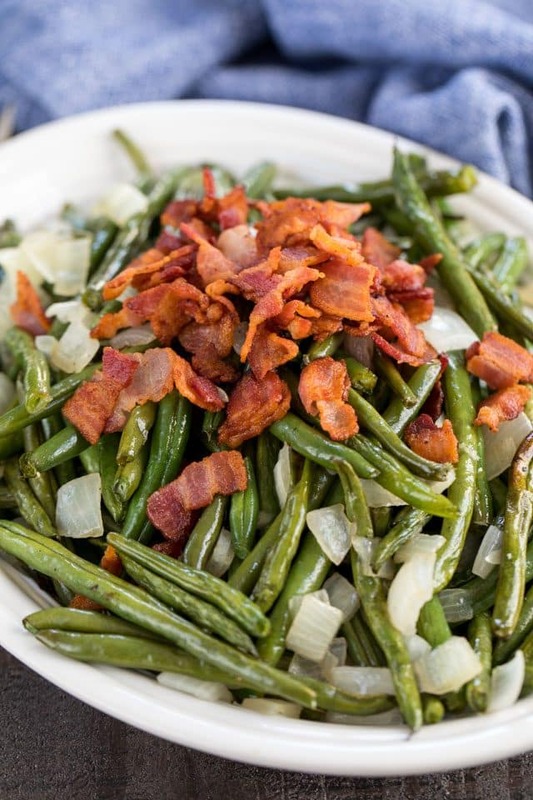 Roasted Green Beans with onions and bacon are the perfect side dish for any meal! This easy recipe is full of flavor. This post is sponsored by Reynolds Wrap, and I used their non-stick aluminum foil to make roasting and clean-up a breeze! I’ve been to many holiday meals where the vegetable wasn’t really a vegetable: from green bean casserole to cheesy broccoli bake, those have vegetables in them but I don’t count them as vegetables. I love having some sort of a vegetable dish on my holiday table, one that actually resembles what it really is. Maybe it’s because I like to carb load my plate at Thanksgiving and Christmas, but I feel like if I have a little something green on there, the extra servings of mashed potatoes, knoepfle, stuffing and rolls don’t count. That’s where this easy roasted green bean recipe comes in. Starting from when I was a teenager, I always made some sort of green bean side dish at the holidays. Knowing that it’s a special occasion meant I’d add onions or bacon or almonds, because you can’t have plain old boring green beans on a holiday. Back in the day I would microwave the green beans and then toss them in a frying pan with the add-in, but as an adult I’ve discovered something magical: roasting vegetables. I actually love vegetables (way more than I love fruit), and I like them raw and steamed, but roasting them is my absolute favorite. From broccoli to asparagus to green beans, roasting vegetables brings out a delicious flavor that’s so much better than just steaming or sautéing. I’ve discovered I like so many more vegetables when I roast them, including Brussels sprouts and cauliflower. 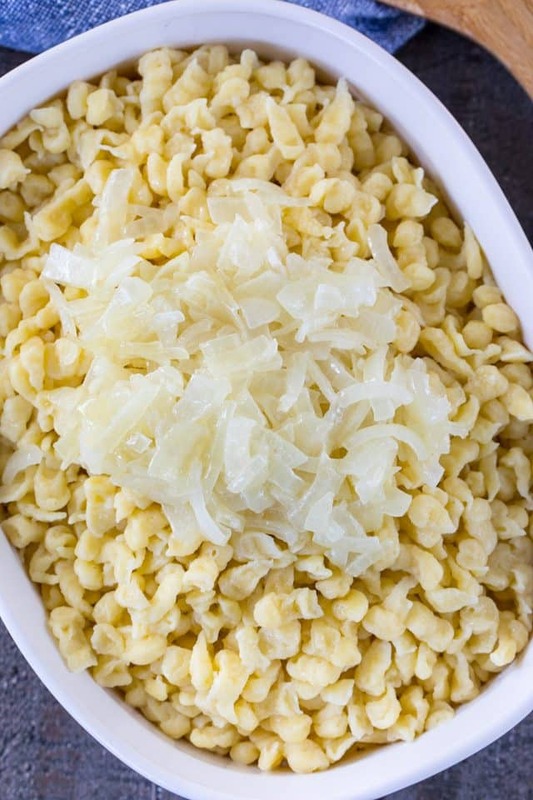 This simple side dish is easy to prepare and even easier to clean up, and will add a bit of green on your holiday table. There are so many ways you can make these roasted green beans: with bacon, with onions, or even with parmesan. On fancy occasions I love using bacon and onions. It makes you feel like you’re having a special dish and not eating something somewhat good for you, even though it’s better than one of those “vegetable” casseroles full of cheese and condensed soup. And, I mean, you can’t go wrong with bacon, right? You start this dish by frying up some bacon. Dice it up first the cook it to however crispy you like it. I prefer to use center cut bacon because it’s less fatty than regular. I’m not a huge fan of bacon fat, but it is important to have some for this dish, so center cut is perfect. Reserve the bacon fat to season the vegetables with! I tossed my green beans and onions with a bit of the bacon grease, for flavoring. Salt and pepper to taste and then you’re going to roast them. The secret to making amazing roasted vegetables is lining your pan with foil. 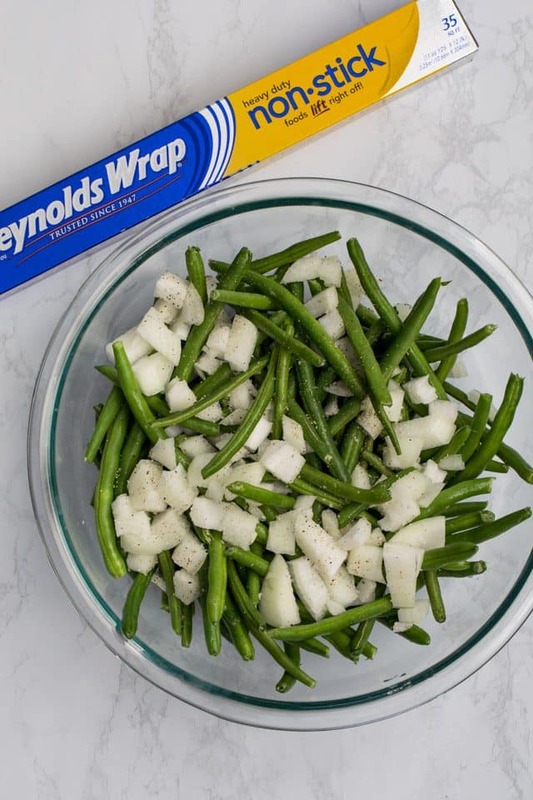 This allows for an easy clean-up, and if you use Reynolds Wrap® Non-Stick Aluminum Foil, you don’t have to grease the pan or use any extra sprays! 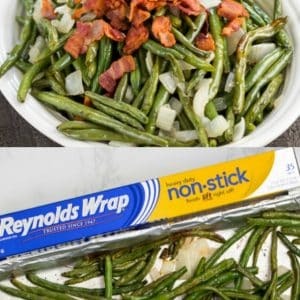 Reynolds Wrap Non-Stick Aluminum Foil is made of Heavy-Duty Foil with a non-stick coating on one side (the dull side). Simply line your pan, dull side up, and add your vegetables. You don’t need to spray it with cooking spray and you can use a minimal amount of oil on the vegetables themselves. I just used the bacon grease to add flavor, but you can even skip that part if you want. 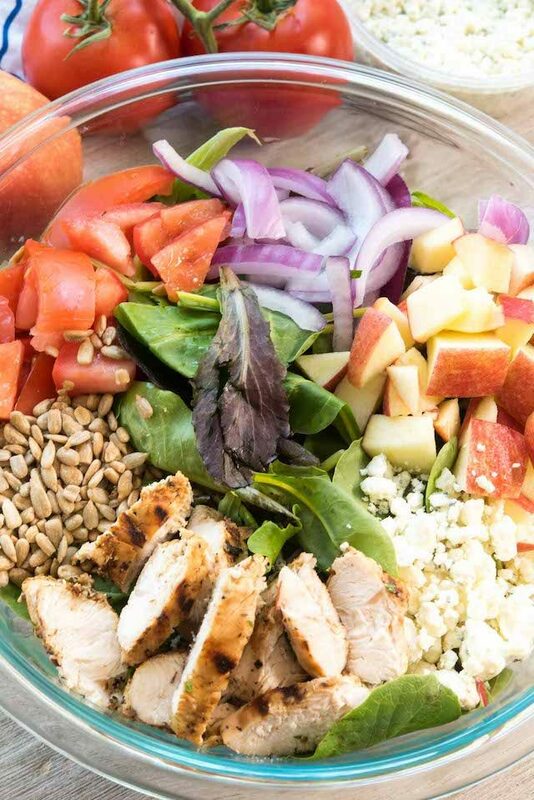 Reynolds Wrap is produced using food safety and quality standards and proudly made in the U.S.A., making the foil my go-to in the kitchen (and on the grill). How long does it take to roast green beans? I roast my green beans at 400°F for about 20-30 minutes, or until they’re crunchy yet cooked through and starting to shrivel and brown. Be sure to stir them at least once or twice during cooking to make sure they cook evenly. This roasted green bean recipe is perfect for a crowd: I used almost a pound and half of green beans. If this is for a holiday, it’ll serve quite a few people. 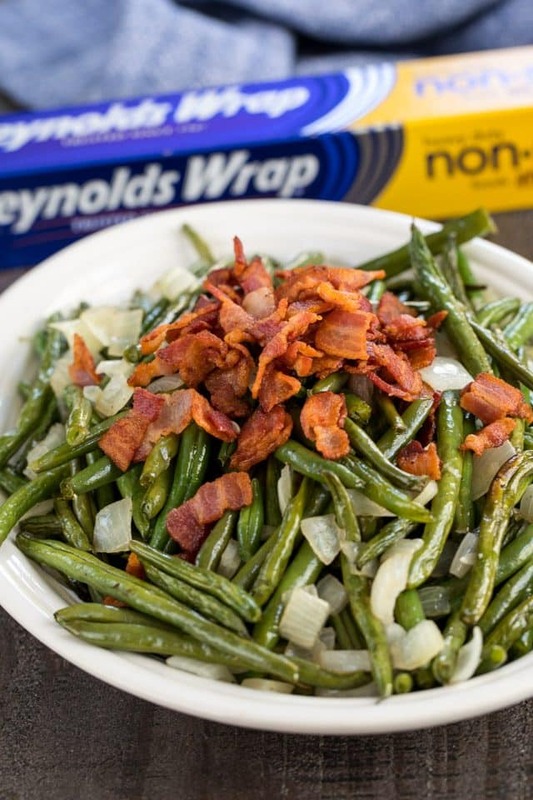 Once the green beans and onions are roasted, toss them with the bacon bits and serve. The bacon grease adds extra flavor and everyone will love that they have a green side dish that’s not a boring one! Plus, if you use Reynolds Wrap Non-Stick Aluminum Foil, clean-up is a breeze: simply throw it away! You won’t even need to wash your pan. 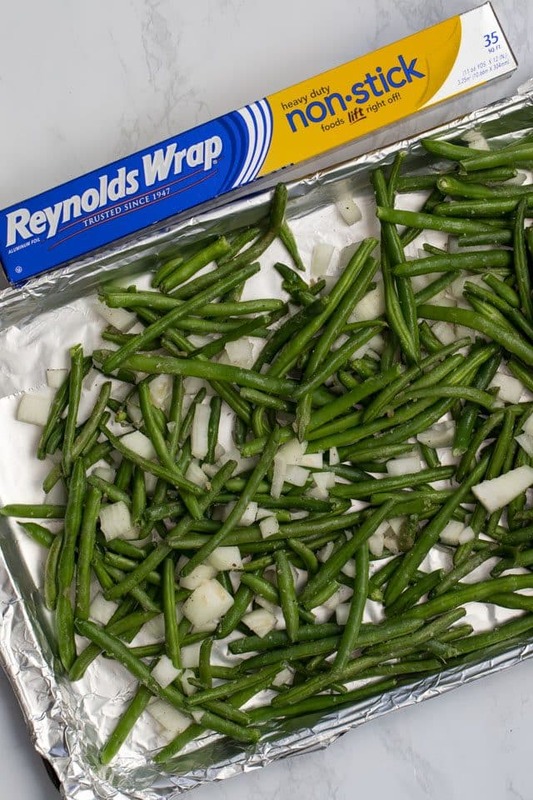 Use Reynolds Wrap Non-Stick Aluminum Foil for easy clean up and to omit the need for extra oil. 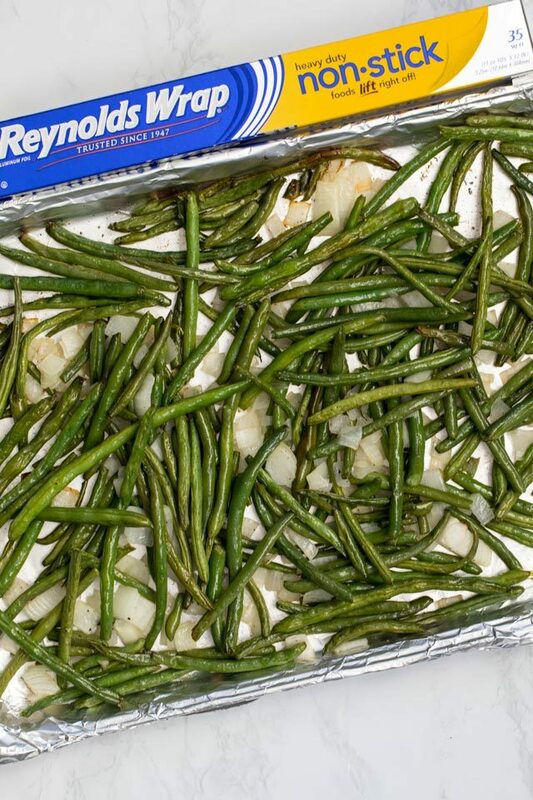 Try to place the green beans on the baking sheet in an even layer. 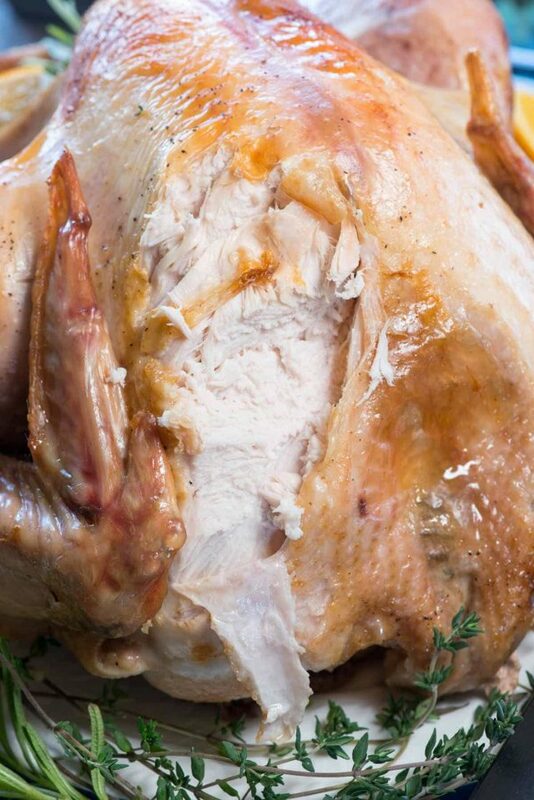 Stir at least twice during cooking to ensure even roasting. Toss your green beans with bacon grease for extra flavor. Serve hot, but store in the refrigerator for up to 3 days. 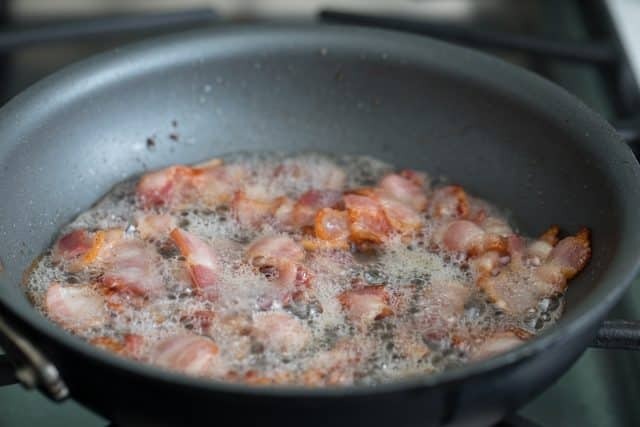 Cook bacon in a small frying pan until crispy. Remove from pan to drain on paper towels. Reserve bacon grease. Place green beans and onions in a large bowl. Add about 2 tablespoons of the reserved bacon grease. Sprinkle with salt and pepper, toss to coat. 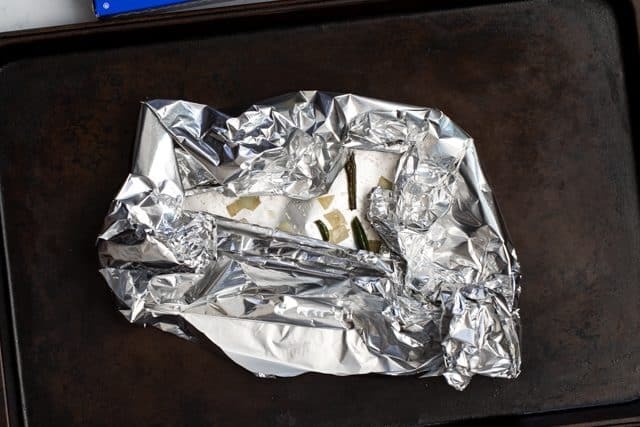 Cover a cookie sheet with Reynolds Wrap® Non-Stick Aluminum Foil. Spread green beans in single layer on cookie sheet. Roast for 20-30 minutes, or until green beans are browned and cooked. Toss with bacon and serve hot. 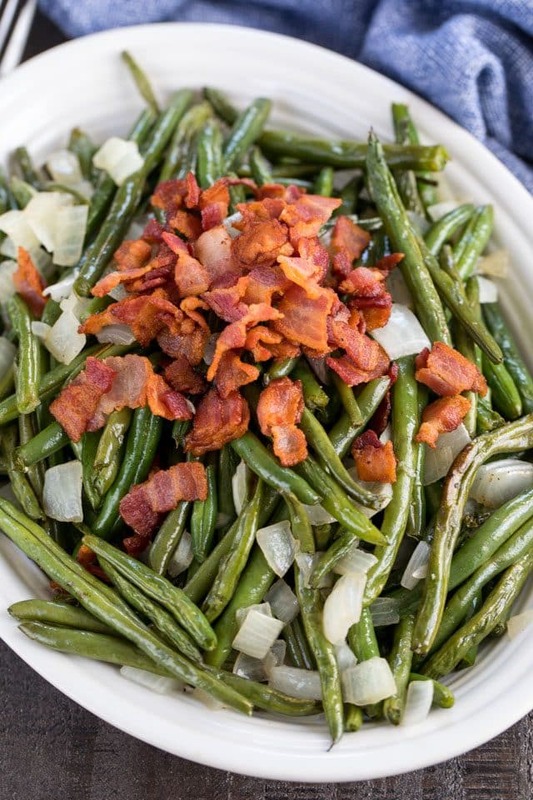 Green beans are always on my Thanksgiving menu – better with bacon! I put the non-stick foil on my shopping list. This makes me extra excited for turkey day. Love that bacon!! This looks like SUCH a good side! Love bacon with green beans! A little bacon makes EVERYTHING better! !